Is this Acronicta lobeliae? Wagner's photo, and John & Jane's photos, show less colorful individuals. 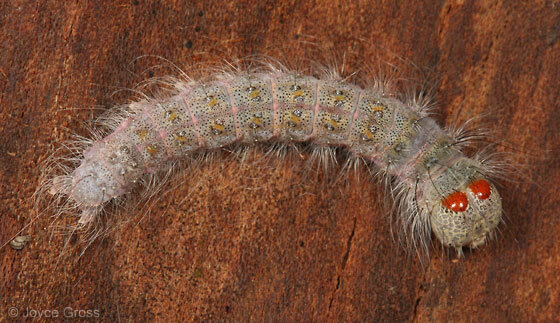 My caterpillar has a lot of pink. Otherwise it seems to match. Also including a close-up of the "minute black spines" coming out of the peppery black spots (per Wagner). I'm afraid I didn't note the host plant (and don't even remember if it was on a plant when I found it). I brought it indoors to photograph, from my parents' land, because I went out without my camera. but Wagner says there ar 50 species of Acronicta east of the Mississippi! Notice how similar laetifica and spinigera are too, page 334. Plus Wagner talsk about a possible undescribed species which keys out to lobeliae too, though he's fairly sure it's not lobeliae. We could change it to lobeliae species group?? What a beauty! Maybe we should leave this at the genus level. It could be one of the Acronicta not in the book (even a known species -- Wagner shows a little over half of the 50 known species). I was just hoping it wasn't so! Yes, laetifica and spinigera are similar, though I don't think they look as close as lobeliae. I don't have enough caterpillar/moth knowledge to know if it makes sense to make a lobeliae species group. I'll leave that up to you or someone else more knowledgeable than me to decide. :-) I'm happy to have a genus on this one in the meantime.